DrinkMate Carbonated Soda Maker has an average rating of 4 out of 5 based on 6 user reviews. There is a lot to love about this practical and extremely affordable soda maker from DrinkMate. This market has been dominated by SodaStream for a long time, but DrinkMate is gaining in popularity. This is because the DrinkMate Carbonated Soda Maker allows you to carbonate liquids other than water, which is all the SodaStream is designed to do. With this product, you can make sparkling wines, teas, iced teas, coffees, and juices. Judging by the online feedback, the Drinkmate Carbonated Soda Maker is very well loved and users have few, if any, complaints. It is a practical machine that can add some fizz to your daily life. When you buy this product, it comes with the soda maker, a plastic bottle that is BPA-free, and a 3-ounce carbonator. The patented detachable fizz infuser means clean up is easy. It also means you can control the amount of CO2 going into your drinks. There is a carbonation preserving cap included as well to put on the fizz infuser when not in use. You can buy this machine in three different colors – black, white, and red. You do not need batteries or electricity to operate this machine. Among soda makers, the DrinkMate is quite easy to use with the quick-connect mechanism. However, when compared to SodaStream machines, it has a few extra steps due to the fizz infuser. This machine comes with a 3-ounce carbonator. You can use 60L (14.5 ounces) SodaStream carbonators as well. The idea is that each carbonator can get you through roughly 60L of water, although many users report not getting quite that much use out of them. The 60L canister is going to cost you around $30, so factor that into your budget if you plan on going that route. When the canister is empty, it can be exchanged at several retailers such as select Bed Bath & Beyond, Costco, Target, etc. Follow this link to find a retailer near you.. Every exchange costs $14.99 but there are cheaper, DIY options. Also, the presence of the fizz infuser makes the DrinkMate easy to clean and use. The DrinkMate has gotten some of the best reviews out of all soda makers with very few complaints so it’s very likely that you’ll enjoy yours too without issues. If there is, there’s always the 2 year warranty to back you up. Finally, all these incredible features are available at a great price as the DrinkMate’s cost is similar to the cost of SodaStream’s entry level models. 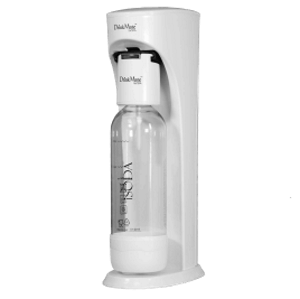 Not only is the Drinkmate able to do so effectively, it’s also able to take advantage of the SodaStream refill system making exchanges convenient and cheap. Users love the DrinkMate carbonated soda maker. Almost unanimously, they say that there’s worked perfectly and the especially appreciated the ability to carbonate drinks other than water. If you were to get a SodaStream machine, it’s explicitly written to just carbonate water while using other liquids is one of the selling points of the DrinkMate. Overall, it seems very unlikely that you’ll encounter an issue with the DrinkMate and you’ll almost surely be able to enjoy your delicious carbonated beverages without too much trouble. I while back I got hooked on drinking a lo-cal sparkling iced tea, which at the time was $2 per can in-store, and online by the 12-pack for $15. But I was going through 12-packs pretty quickly, especially after my sons discovered them! That’s when I started looking for a product I could use to carbonate my own drinks. After checking a little I decided to go with SodaStream, but it’s recommended for using only to make sparkling water, to which you then have to add flavors or syrups. Sounded like more cost and more work to me. Then I came across the DrinkMate. The ads said it could carbonate ANY beverage. As soon as it came I put it to use making my own sparkling tea. Very pleased! The fizz to the drink is every bit as good as the store-bought stuff. It’s a little more expensive than SodaStream, but it can carbonate anything you want that doesn’t have thick, fruity pulp in it, or re-carbonate sodas that go flat. So I’m thinking that they could have charged more for the DrinkMate and it would still have been a great deal. Now I pay under $6 for a 12-pack of 16 oz bottles! This is a big plus for anybody addicted to their sparkling drinks the way I am. It feels sturdy enough and comes with a 2- -year warranty. It’s easy to use, though it takes a little experimenting to get the fizz just the way you like. And it works fast. If you’re looking for a good carbonator, you should give the DrinkMate a try. I was thrilled with this gadget when I first got it. My family raved about it for the first six weeks or so. Then we started having troubles. The carbonation button didn’t work right, and eventually the unit stopped quit altogether. I couldn’t get hold of the company’s customer service and couldn’t find any support online. The DrinkMate was a great gift, but now that it needs repair or a new part, I don’t know where to turn. 1. The drink stays carbonated longer. I just leave the CO2 infuser in place when I put the partial bottle back in the fridge, and give it a quick shot of extra carbonation. 2. The bottle tilts back snugly into the carbonator, which is easier and more reliable than the Sodastream. 3. You can let some gas escape with good control so you don’t have to worry about foamy spills. 4. The DrinkMate also cleans up easier, usually just by giving the whole infuser a good rinse. NOTE: My adapter valve did get stuck on open once, which had me worried. But I got it sorted out. So, after a year of use, I’m still happy with the DrinkMate. I used to use a SodaStream to make my own sparkling water, but I gave it away when I bought a fridge that had a carbonator built into it. But I still wanted the DrinkMate when I came across it. First, the fridge, or the SodaStream for that matter, only carbonate water, while the DrinkMate carbonates anything. Everyone in the house can fizz their own favorite beverage. I’ve been drinking my own fizzy wine coolers. It’s going to be a good summer! The DrinkMate doesn’t give you room to use the big bottles. But you just attach your single-person bottle and press the button. The DrinkMate gives you a better fizz if you can remove the bottle with the CO2 head still attached and give it a shake. Then slowly release the pressure before you open the bottle. It stays twice as fizzy as the SodaStream water, and you’ll use less CO2. We bought one of these DrinkMate seltzer makers over two months ago, and are happy with it. My only disappointment was that the smaller CO2 cartidge that comes with it doesn’t last long, and in some areas they won’t refill it. Buy the version that will take the larger canister good for 60 liters of soda. Even so, it’s still a lot easier than logging home cases of sparkling water from the store. And the bigger the bottle, the more likely it is to go flat before you reach the bottom. Not a problem with the DrinkMate, which lets you make single-serving sizes or refizz any leftover. I bought a Drinkmate a couple of months ago and have been very happy with it. It did take some tinkering to get used to, however. For example, it’s important to let out the residual gas after carbonation because otherwise you won’t be able to unscrew the bottle. This step wasn’t posted in the directions that came with the product so it took me longer than I care to mention to figure this out. But once I did figure it out, I’ve had no problem with it. Maybe others would find this step obvious but not me. Even though I got the product because I liked its ability to carbonate liquids other than water, I have yet to try out that feature because I’m so pleased with the carbonated water. I’ve yet to exchange the canisters and am a little upset that the closest store is 700 miles from me. This means I’m going to have to deal with mailing the canisters back which seems like a hassle to me.